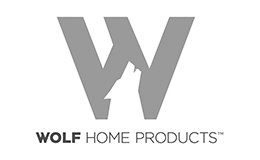 Wolf Home Products is built on more than 170 years of experience. We are one of the largest suppliers of Kitchen and Bath cabinetry in the nation, as well as a leading supplier of Outdoor Living and Building Products. We offer premium products without the premium price. Our high quality products are engineered to provide unmatched value and are backed by industry-leading warranties. Wolf Home Products conforms to ISO International Standards, so you can have confidence that you’ll receive great quality products and service. Our culture of continuous improvement keeps us on the leading edge to ensure satisfactory performance. Make the most of your kitchen space with storage built into your Wolf cabinets. Semi-custom kitchen cabinets that provide unsurpassed style, selection and standard features. Whatever life throws its way, no mess is too big (or small) for Wolf Signature Cabinets with SmartShield™ Technology. Wolf Transition cabinetry makes it easy to design a kitchen where everyone feels right at home. Get inspired. Click here to view our Wolf product catalog. Click here to view Aristokraft product catalog.